In October 2009, Wardsville’s quilt committee began designing a quilt to commemorate their community’s founders, Mr. and Mrs. George Ward. 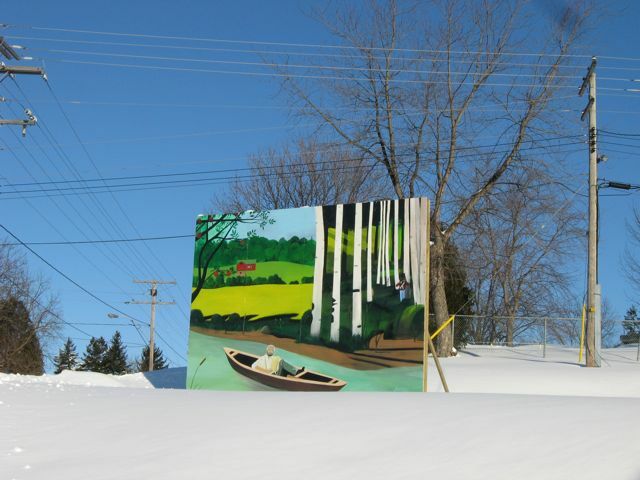 The initial idea came from Denise Corneil, an artistic community leader, who had caught sight of the rural folk art phenomenon called “barn quilts” sweeping the United States. She was impressed by the news that the Temiskaming International Plowing Match 2009 in northern Ontario had created a barn quilt trail featuring over 90 barn quilts. Eleanor Blain and Sue Ellis (show in picture), experienced quilt makers, quickly came up with a scheme to create a quilt involving as many women as possible. It did not matter whether they were skilled needle workers. It was a communal project involving as many mothers and daughters as possible. They wanted a story line for the quilt. Ken Willis, the local historian told them the story of George Ward. In 1810, Mr. Ward was requested by the British Government to establish a stopping point for travellers along a section of Longwoods Road between Thamesville and Delaware, in Upper Canada – the Western District. A retired soldier with a young family, Mr. Ward was asked to supply provisions and fresh horses for the military. Ward’s family carved a settler’s homestead out of the forest and called it Ward’s Station. Two years later war broke out. On March 6, 1814, the Battle of the Longwoods took place a couple miles east of his homestead. Ward and his wife suffered many trials and tribulations. Accused of treason by the British, George Ward went to his grave in 1837 still trying to clear his name. His remains are buried in the Wardsville cemetery. With a romantic and somewhat mysterious life line to work with, the quilters poured over heritage quilt block patterns. Thirty blocks were selected to tell the story of Mr. and Mrs. Ward. The feminine side of the story could not be omitted. It was clear Mrs. Ward played a critical role. Barn quilt block designs were carefully selected to represent the family’s struggles, the Battle of the Longwoods, and the social history of that time. Their family story was brought to life through the choice of quilt blocks, colours, and quilt design. When it was unveiled at Wardsville United Church May 14, 2010, the crowd gasped in awe. 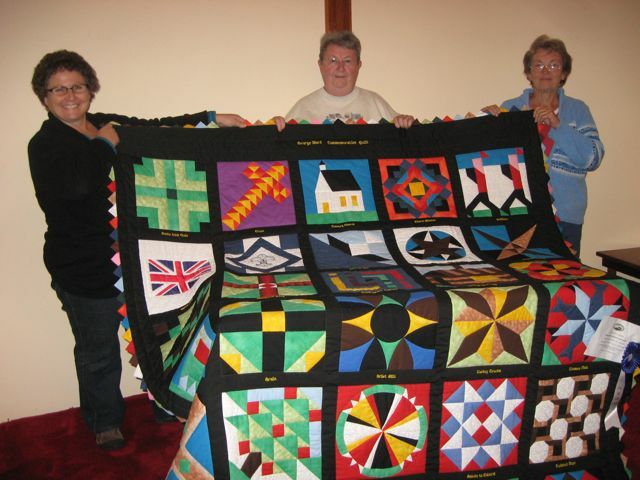 The following Saturday, the George Ward Commemorative Quilt was taken to Shedden for the 2010 International Plowing Match Quilting Competition where it took second prize in the group category. Posted on March 29, 2011, in Barn Quilt Trails. and tagged George Ward Barn Quilt Tour, War of 1812, Wardsville. Bookmark the permalink. Leave a comment.